alaTest ha raccolto ed analizzato 157 recensioni su Wahl 79110 Baldfader. La media della valutazione per questo prodotto è 4.6/5, confrontata con la media della valutazione di 4.3/5 per altri prodotti. Abbiamo analizzato differenti valutazioni di esperti ed utenti, età del prodotto ed altri elementi. A confronto con altri prodotti, Wahl 79110 Baldfader ha ottenuto un alaScore™ complessivo di 87/100 = qualità Molto buono. This was bought for my son and it does everything he needs to keep his hair in trim. 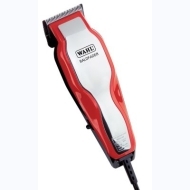 It was a good price too and along with the famous brand of Wahl is an excellant buy. Very easy to use and set up. Just one level on the clippers. The bald fader is a really close cutting machine. Be very careful when using for the first couple of times I cut myself being a bit enthusiastic with it! Very pleased with item received, good quality, easy to use, great value for money. Trimming, cutting, styling it is what it is and for the price very good . I feel fully coiffured 'and' the Vet says the collar can come off when it grows back.